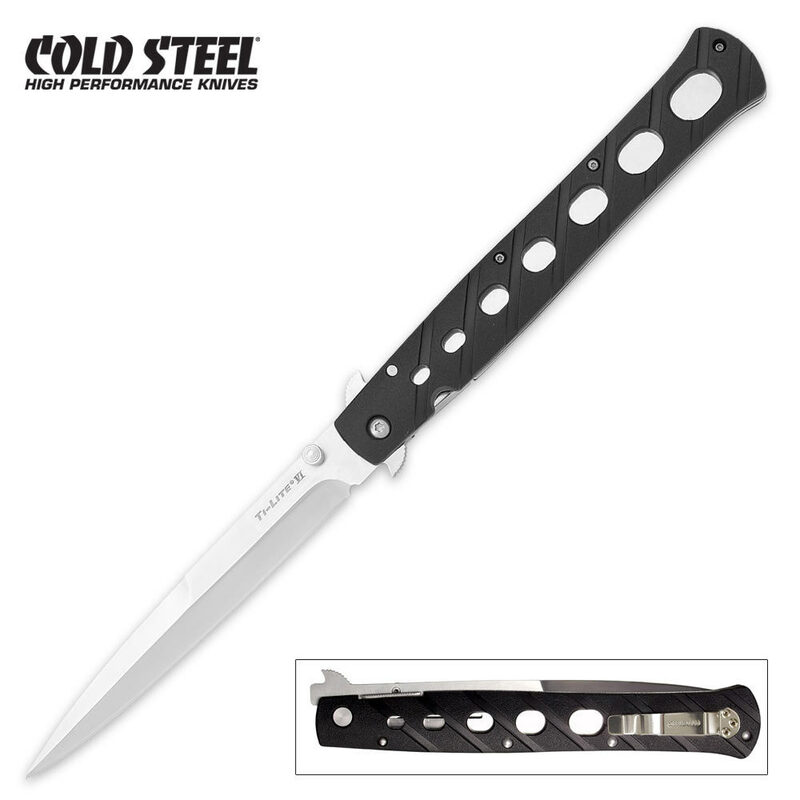 Switchblades From The 1950’s Reincarnated In New Cold Steel Ti-Lites These smooth tactical folders echo the swift lines of the memorable 1950’s classics. Legal to carry almost everywhere, the AUS 8A stainless steel blades feature razor sharp edges and sturdy needle sharp points. The impact resistant Zytel handles feature full length 440A Sub Zero quenched stainless steel leaf spring locks an dliners. Each is equipped with small, unobtrusive steel pocket clip. 13" ov. 8" bl. This is not an actual switchblade. Strong as hell, sharp, but it will get confiscated if you carry it in public. At 13 inches overall this blade demands and gets respect when deployed. The blade itself is thick,the handle is built like a tank and the knife is feather light in the pocket. Opens on the draw faster than a switchblade. I have learned to draw my knife and throw it in a split second,this blade throws nice...not advised but doable. Sounds like a M1 rifle bolt closing when you flick it open. This is a no B.S. fighting knife.